New York magazine editorial employees, including Vulture, The Cut, Intelligencer, Grub Street, and the Strategist, are now represented by the NewsGuild of New York-CWA Local 31003! The 180-member bargaining unit won voluntary recognition this week. 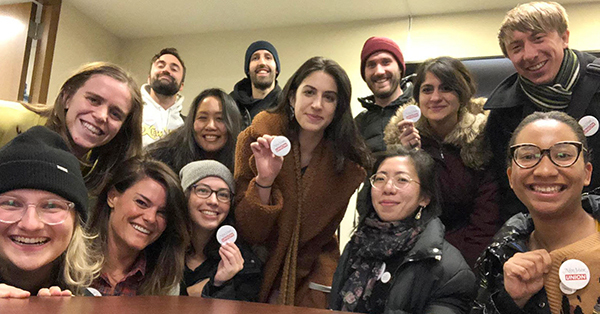 After going public with their union drive on December 12, NewsGuild staff and organizing committee members engaged in several weeks of negotiations over the scope of the union's bargaining unit. Attorneys representing management were adamant that nearly two dozen employees be excluded from the unit based on their alleged status as managers or supervisors, which the Guild rejected. After pushing for and winning the Guild's proposed unit, the organizing committee came to an agreement with management over voluntary recognition of the union. "We are proud to announce that New York Media has recognized the New York Magazine Union, which is supported by an overwhelming majority of the editorial staff," said the organizing committee in a statement. "After weeks of negotiations, we fought for, and won, a unit that includes all of our eligible editorial colleagues. Now that our union is official, we are very excited to begin the next steps of this process and move on to collective bargaining." New York magazine editorial employees won voluntary recognition this week. CWA AT&T Mobility Brigade members from Arizona, California, and Washington held an organizing blitz this week in the Phoenix area. They signed up new members at AT&T Mobility retail stores and at the Mesa call center. They also gathered organizing leads at Verizon Wireless and T-Mobile, encouraged members to contribute to the CWA Political Action Fund (PAF), and identified more potential stewards.